The most popular manifestation of Orientalism during the War years was Chu Chin Chow. This had plenty of pretty girls and jolly tunes, and above all Ali Baba a fat cowardly central character who was as far from the positive heroes of propaganda as you could possibly get. The show was pure wartime escapism, morally as well as geographically. The most popular manifestation of Orientalism after the War seems to have been Alf’s Button, a very different matter. W.A Darlington’s novel appeared in1920, was filmed the same year, became a stage play in 1924, and was re-filmed as one of the first British talkies in 1930. In 1938 the Crazy Gang made Alf’s Button Afloat. My undated copy of the novel says “Twentieth printing, completing 258,312 copies”; this is a book that hit the public taste. Alf’s Button is all about the contrast between wartime reality and Chu Chin Chow -style escapism. It begins in the trenches, with a deliberately downbeat scene of a battalion taking over a quiet section of the front. It shows the dull routine of war, and introduces officers getting on with an onerous job while Alf, the unsatisfactory private, prefers to shirk. He was devoted to cricket and rowed in his college boat. He was commissioned in the 7th battalion of the Northumberland Fusiliers in 1915, and served in the trenches (being wounded at Arras) during the First World War, at the end of which he was a captain. He enjoyed himself even in such conditions, and in 1916 he began sending humorous sketches to Punch from the trenches. Alf’s new uniform has a button made from Aladdin’s lamp, and the fun starts. A formidable genie appears, and when Alf orders “Strike me pink!” obeys, so that Alf gets a skin condition that confounds all the army doctors. Gradually he becomes more adventurous with his wishes, and lets his friend Bill into the secret. There is always a mismatch between fantasy and reality. When they call for beer, they get a strange Arabian brew; when Alf orders the genie to bring down a plane from a dogfight, the potentially victorious British plane is downed rather than the German. When they ask for a woman, he brings a society beauty who is way out of their league. Premonition that something will always go wrong prevents Alf from carrying out Bill’s suggestion that the genie should kidnap the Kaiser and so end the War. The privates are presented as having extremely limited imaginations, and part of the comedy comes from seeing their slow minds coping with extraordinary situations. The big joke becomes the difference between the Oriental luxury of the manor and the expectations of the English countryside. When the vicar’s wife visits, she is scandalised by the scantily-dressed serving-maids draped all over the place. Rumours spread in the village that the presence of black people must mean sexual perversion and the influence of a Pemberton-Billing style “hidden hand”. In wartime wasteful luxury is a total scandal, and so are gold coins. Doubtless followers of Edward Said would fume at the story’s comic Orientalism – but would they be right to do so? The British soldiers are obviously hopelessly unworthy of the oriental splendour in which they find themselves, and the puritanical horror of the vicar’s wife at the sight of fetching houris is a sign of her provincialism. I think Darlington has produced rather a clever double irony. The humdrum grim nature of modern war makes oriental romance seem ridiculous, but the excesses of exoticism show up the limitation of British imaginations. Another small irony is that when Alf and Bill, soldiers in the most destructive of wars, read The Arabian Nights in an attempt to understand their situation, they are horrified by the bloodthirstiness of the characters in the book. But then, as soldiers, their jobs are not notably aggressive. They are mostly involved in menial fetching and carrying – something true of most soldiers in the war, most of the time. Until, that is, the end of the book. Bill has stolen the button from Alf (who in his opinion is too timid in his use of its magical powers) when the Germans attack. “Comin’ corp’ril,” shouted Bill. All thought of Eustace, the Button, the Kaiser – everything had vanished completely from his mind. He thrust the precious button carelessly into his pocket, grabbed a rifle, and tore upstairs… Nobody seemed to know what had happened, or exactly what they were going to do, except that they were going to kill Boches. They are successful in repelling the attack, but Bill is knocked out when the trench collapses. On waking, he looks for the Button, but the only thing in his pocket is a hole. Did Darlington want us to pick up the message that romance has been lost somewhere in the Flanders mud? Or did he, with an author’s generosity, leave that as one of the possible meanings we might take from the book, or not, according to taste? A poster for the 1930 film. This entry was written by George Simmers and posted on October 29, 2007 at 10:49 am and filed under Film, novels, Theatre. Bookmark the permalink. Follow any comments here with the RSS feed for this post. Post a comment or leave a trackback: Trackback URL. I took a look at Darlington’s autobiography, “I Do What I Like”, and it reveals that the composition of “Alf’s Button” had a rather more complicated history than I indicated above. Darlington wrote a version of this incident for Punch, which published it, a bout a month after the original event had happened. Shortly afterwards, he was wounded and sent home. he seems to have written a first version of “Alf’s Button” as a sort of therapy while convalescent. He sent it to Punch, who did not want it, so he submitted it to “The Passing Show”, whose editor liked it, but wanted it doubled in length, from 15,000 words to 30,000. Darlington made additions, and the magazine published it. The publisher Herbert Jenkins said he liked the story, but its length would need to be doubled again to make a novel. Darlington obliged, and that is the version I read this week. 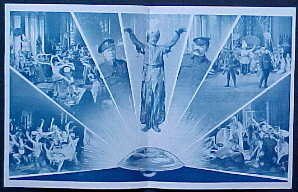 The 1920 film and the play are both radical re-workings of the material. An example of the variations: in the ‘Passing Show’ version, Alf has a girl-friend called Liz. She disappears from the novel, but returns in the film and has a more significant part in the play. I may take a look at the ‘Passing Show’ version, if I can get hold of it. From what I can gather it is entirely set on the Western Front, with no diversion to England. In fairness to Harold Hobson he was almost alone in barking up the right tree twice- with Pinter and Beckett- so he could be often wrong and still score highly. Thanks for telling me this. I knew that “Alf’s Button” was popular, but I didn’t know that it had given rise to a souvenir industry. I wonder if the souvenir was made at the time that the film came out (1920). That would have reached a larger audience than the “Passing Show” serial, or even the best-selling book. I was really interested to read everything on this website. My grandfather Bernard Ambrose Hardy was in the trenches in France in WW1. I was also told by my late father that my grandfather was aked to sing in the film ‘Alfs Button’. I would love to see the film to see if I can spot my grandfather. Can you help? The question is – which film? There was a silent film of 1920,of which the British Film Institute has the last reel (about ten minutes). But singing does not seem very relevant to a silent film. In 1930 one of those unsatisfactory half-talkie-half-silent films was made. More likely to include singing, to show off the new sound capability. The BFI catalogue does not include a copy of this film. There may be a copy in some other collection, or it could be one of the all-too-numerous lost films. Finally,there was Alf’s Button Afloat, made with the Crazy Gang in 1938. The BFI has a viewing copy, and a while back I managed to buy a DVD on the internet. The comedy has its moments, and Alistair Sim is great as the genie. I don’t remember much singing in it, though. So the 1930 version is the likeliest place to find your grandfather – but also the hardest to find.